Meaning: Expect the unexpected when The Fool Tarot Card turns up during your Tarot reading. Be mindful of influences that could have a dramatic affect on the decisions and choices you make. When The Fool Tarot Card appears it can be a time for a new beginning or perhaps a journey into the unknown that will bring fun and excitement. It also means that your trials along the way can make you a more experienced and wiser human being. If The Fool happens to fall in the first position of a reading you will need to exercise caution. This could indicate fool hardiness or possibly that the question you are asking now is the wrong one. It can also show that you are asking this question for the wrong reasons. The Fool can also represent another person in a reading. If this is the case then you should be prepared to meet a real maverick, an eccentric person with undying lust for life. The Fool Card represents the untapped potential in all of us. He is frequently accompanied by a dog, often seen as his animal desires, sometimes as the call of the real world, nipping at his heels or distracting him. The picture shows he is oblivious that he is walking towards the edge of a cliff, supposedly about to step off. The Fool Tarot card doesn’t have a specific place in the sequence of the cards. The reason being it that it’s numbered 0, which signifies the number of indefinite potential. The fool appears either at the beginning or end of the Major Arcana, and as it is, he is ever present in the situation, thereby needing no direction represented by numbers. The card represents a fool at the beginning of his journey, which is full of uncertainties, but with unlimited potential. The sunrise marks a fresh beginning – the beginning of a new journey. The fool is also facing North-West direction, which is often considered the direction of uncertainty. He is seemingly facing upwards, watching the skies. At his feet, he is about to step off a steep cliff. The cliff below him represents the material world he wants to step in when he is not even prepared for it. On his staff, he has a small bag that contains all his tools and resources he will need for future challenges. But as it is, he has not even opened the bag which also signifies that he has no need for the resources provided. He has a white rose on his left hand, to signify purity and innocence. But still on his left side, lies a company in form of a small white dog. The dog is supposed to offer protection, but also teach him lessons that fools need to learn. Finally, the white and blue mountains behind him are the realms of the spirit. He will need them, but he won’t find them easily when time comes. We have it that the upright represents the beginning, innocence, free spirit and spontaneity. 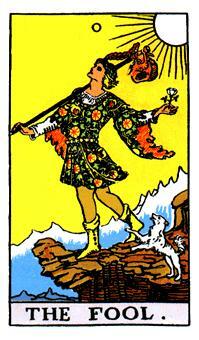 As it is, the fool tarot is a card of extreme potential, marked with innocence and inexperience. In short, it signifies the ability for one to reach their highest potential, renewal and new beginning. Each day is fresh and marked with adventure. It is the beginning of all creativity and goals in life. In his mind, the fool is convinced that anything can happen, so he is just sitting back, waiting for the right time. There’s a need to set forth on a journey – a journey full of uncertainties, that will lead to territories never explored before. It’s about personal growth and development, adventure and new experience. The upright simply requires you to step into the unknown, fully convinced that the Universe will reward you when you make the first step. Consequently, such situations require you to be carefree, free from worries or anxiety that try to pull you back. The fool never minds what lies ahead. It represents a very important choice to be made in life, even though a number of factors are affecting the choice. When faced with a hard situation of doubt, this card encourages you to step forward no matter what will happen. You only need to have faith that the Universe is taking you in the right direction. Therefore, if you are currently experiencing fear in whatever thing you want to do, the upright fool is a good tool to help you meditate. Because it puts emphasis on risk-taking, you will certainly venture into new ideas never explored before, hence your success. He is the spirit without fear but full of curiosity and anticipation of what lies ahead. And with such, failure has no place. On the other hand, the reverse of this card signifies naivety, recklessness, foolishness and risk-taking. It signifies that one is acting with total disregard of what will happen. Instead of planning ahead or sticking to the routine, they are trying to break free to discover themselves, but in a senseless way. It simply warns you of getting into a deal you do not understand clearly. If the deal is too good to be true, then it will certainly turn out sour. And even if you decide to step forward, you need to be fully prepared of the challenges awaiting you. In other words, carry out your research well so that you are not caught by surprise. If it’s a job interview, speech or meeting, prepare for them well so that you are not taken aback. In career application, it means you don’t want to take up an opportunity you an unsure of. Instead, you want to be competent in the career first, before taking up the opportunity. You simply don’t want to follow the wind of uncertainty at your workplace. In relationships, it signifies a high degree of uncertainty, so you can’t fully rely on the other party. At this point, you are not even sure about the direction in which the relationship is taking. Both parties are risk-takers, with little to no regard of the consequences of going into such a relationship. Even though it may bring some excitement, it may also bring some insecurity. As it is, we have it that the reverse of this card basically represents what you do when you are not careful. The consequences are bound to be very negative, and that’s when you wake up to the reality. Those who make certain decisions in life without thinking twice are bound to lose a great deal, hence the name ”fool”. Therefore, the reverse of the fool tarot is equally important as the upright significance. If you believe in a fresh start, full of unlimited opportunities and adventures, then you probably need to rely on the upright side. Those who believe in a journey of renewal, free spirit and energy should definitely overlook the thoughts that provoke doubts in their minds. On the other hand, the reverse side warns you of taking a leap of faith, or getting into deals without being prepared. It basically cautions you that there’s a chance of facing bitter consequences when you act recklessly. It’s the contrary of the upright fool, and very significant in making day to day decisions that affect your life.